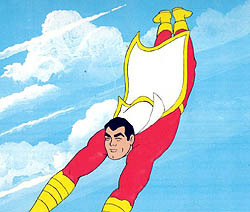 Captain Marvel in the Kid Super Power Hour with Shazam! The Kid Super Power Hour with Shazam! is an NBC Saturday-morning cartoon produced by Filmation Studios in 1981. Hero High - A group of students attend a high school for superheroes. Shazam! - Based on the DC Comics series of the same name, the adventures of Captain Marvel and his Marvel Family (Mary Marvel, Captain Marvel Jr., Uncle Marvel, and Mister Tawky Tawny) as they fight enemies like Doctor Sivana, Mister Mind, Black Adam, Mister Atom, Ibac, and more. From time to time the characters of one show would appear in the other. Isis from The Secrets of Isis also made a guest appearance in animated form on Hero High. The actors who voice the Hero High cartoon characters perform onstage as their characters each week in live-action song-of-the-week and comedy-sketch segments during the program. When some new animals arrive at the Fawcett City zoo, one of the gorillas soon recognized as Doctor Allirog, a talking super-intelligent animal that recently escaped from a cave, having been placed there by the Marvel Family. Allirog is intent on making sure that animals are the more dominant species. He captures Mary and Freddy, then Uncle Marvel, binding and gagging them all, and uses a device that increases Captain Marvel's powers meaning he cannot control them. Mister Mind assembles an army of worms in a plot to take over Fawcett City. Billy and Mary's cousin Freckles Marvel comes to visit and brings Mary a book. That night, the Hiss-Men emerge from the book, capture Billy, Mary, and Freddy by binding and gagging them, and bring them to Ibac in prehistoric times. The three heroes are turned into Hiss-Men as part of the plot to take over pre-historic humanity. A tornado ends up sending Mary Batson, Uncle Dudley, and Doctor Sivana into the Fourth Dimension as Billy and Freddy follow as well. Once there, they end up as playthings for a giant girl named Manga alongside any other creatures that ended up caught in the Dimension Transporter. After a 5,000-year absence, Black Adam has returned to Earth with a plot to resurrect Princess Jemia. When the princess is destroyed, Black Adam captures Mary Marvel and flies off into outer space with Captain Marvel & Captain Marvel Jr. in pursuit. Doctor Sivana, Georgia Sivana, and Sivana Jr. end up meeting an alien who gives them an amulet that gives them superpowers equal to those of the Marvel Family. The Sivana Family calls out The Marvels for a battle royal. Aunt Minerva kidnaps Uncle Dudley who wants him to be her husband. It's up to the Marvel Family to save him. The Marvels are however bound and gagged by Minerva's henchmen after she sees their transformation and placed inside a machine which will make them Minerva's slaves. A disguised Black Adam tosses Freddy a false news publication with the headlines stating, "Captain Marvel Vanishes!". Freddy, as Captain Marvel Jr., rushes the news to Mary to find Billy who might be in danger, assuming that whoever made the false publication knows their secret identity. Night Owl goes to the airport to steal some gold and two tiger cubs. When Mr. Tawny fails to retrieve them and ends up captured, it's up to the Marvel Family to save him and defeat Night Owl. Mr. Atom plans to take over the world using robots he's created, but is stopped by both the Marvels and Uncle Dudley's new invention: a strong remote control door opener that actually can control any mechanical device. Mr. Atom's then captured by the Marvels using a powerful electromagnet located inside his HQ. Doctor Sivana and Mister Mind create a magic grid that harnesses the power of the sun. Meanwhile, Mr. Tawny tries to audition to join Beauregard Jason's circus. An evil alien known as the Star Master threatens earth. When the Marvels confront him, he captures Mary and Junior. He then send an ultimatum to the United Nations: surrender Earth, or else he'll destroy it. The U.N. refuses to bow to his demand and plan to launch a rocket that can project a force field, but they need to know where he's planning to strike. Captain Marvel then goes to Hero High to enlist the aid of some of their students. Note: This was the only episode to feature a crossover with the Hero High segment. In 1982, The Kid Super Power Hour with Shazam! was nominated for a Young Artist Award for "Best Children's Television Series," and Rebecca Perle won a Young Artist Award for "Best Young Actress in a Daytime Series." ^ "Hero High - The Complete Series". DVD Talk. ^ "Awards for The Kid Super Power Hour with Shazam!". Internet Movie Database. Retrieved on 16 October 2008. This page was last edited on 7 April 2019, at 16:39 (UTC).